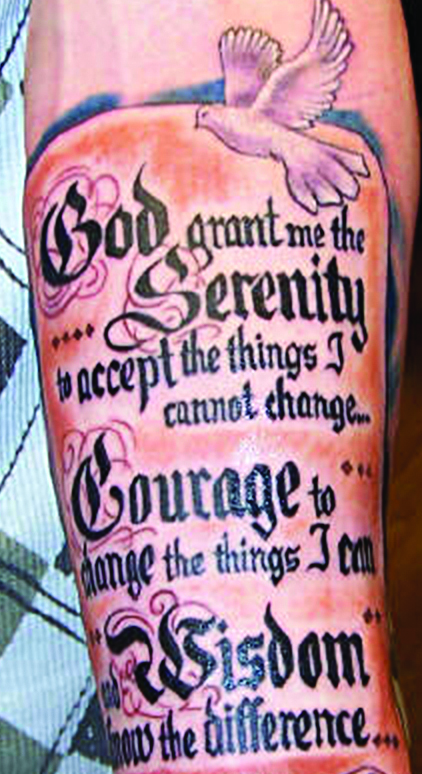 Faith on his arm (reporting from Sewell, N.J.): A tattoo artist finds salvation. SEWELL, N.J. — Tattoos cover most of Harry J. Ake’s body — from his wife Linda’s name on his neck all the way down to his ankles. “I have things on me that are not real holy, and then I have other things that are nicer,” said Ake, owner of Headlight Tattoo and Body Piercing. His newest tattoo — displayed prominently on his right arm — reflects the transformation in his life since his baptism for the forgiveness of sins more than two years ago. “Church of Christ,” that tattoo proclaims. Since his conversion, the 52-year-old Ake has become an active member of the Pitman Road Church of Christ, a 300-member New Jersey congregation, about 20 minutes south of downtown Philadelphia. From leading a Monday night men’s Bible study to helping prepare Wednesday night fellowship meals, Ake is “every preacher’s dream for what a new Christian should be,” longtime Pitman minister Dan Cooper said. The servant-minded tattoo artist even rolls the church’s garbage cans to the street for weekly curbside pickup. With sidebar: To tattoo or not to tattoo?